When Jesus saw that the man was sad, he said, "It will be very hard for rich people to enter the kingdom of God! It would be easier for a camel to go through the eye of a needle than for a rich person to enter the kingdom of God!" While material riches can be a great blessing and can be used to bless many in need and to do great things for the Kingdom, they can also be a trap to many of us. 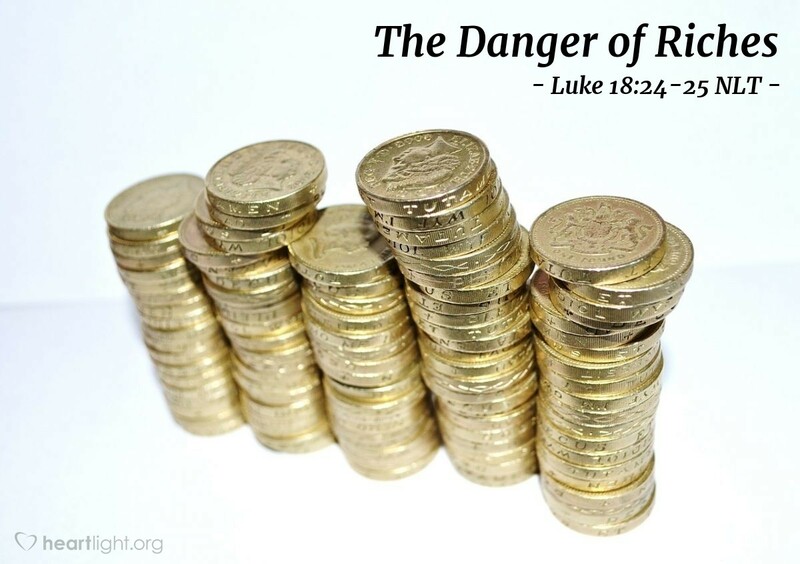 The Gospel of Luke lets us hear Jesus teach repeatedly about the danger of riches. Jesus' point here is that riches can be an incredible danger to the heart of believers. This young man is the living example of this danger. As the apostle Paul warned, greed and a desire for riches can become idolatry and destroy us. Let's make sure that every area of our lives, including our use of wealth, is yielded to the Lordship of Jesus. Father, thank you for your many rich blessings. Help me use these blessings to your glory. I do not want anything to interfere with my total devotion to you. In Jesus' name. Amen.